In my line of work I get to speak with a great number of people all doing a spectrum of very interesting things. Deborah Josephson and Dan Altman are two of these individuals. Two years ago Deborah and Dan decided to start Ashland Brain Harmony, a state of the art Brain Wave Optimization Center. They now provide their services to clients from all around the Rogue Valley, and the rest of Oregon, who are seeking to gain and maintain a greater lifestyle of harmony and healing. I decided to speak with them to learn more about what they do and how they do it. Deborah & Dan, thanks for speaking with me today. Can you start by catching us up to date on what Brainwave Optimization technology is and how it plays a direct role in the healing process of our bodies? Brainwave Optimization is an advanced technology that detects imbalances in the brain using EEG sensors and provides feedback that allows the brain to rebalance itself. Imbalances cause a wide variety of symptoms including sleeping disorders, anxiety, depression, anger issues, ADD, ADHD and memory or learning problems. In a Brainwave Optimization session the client listens to audio tones that are generated in real time from their brain activity. The brain is self-regulating and wants to be balanced and function effectively. During the sessions the brain is able to see itself in this mirroring process and begins to rebalance itself. The brain becomes imbalanced from traumas that we all experience in life. Sometimes the effects of the traumas are immediate in ones life and sometimes the symptoms of imbalance do not show up until years later. When the brain comes back into balance many of the symptoms shift dramatically during the sessions and in the weeks and months following. Because the brain is the control center for the entire body, when the brain is working well, your entire system functions optimally. Approximately 50,000 people worldwide have experienced the benefits of Brainwave Optimization. This was a very interesting and new concept to me. As I am understanding you to say, the brain becomes imbalanced at the point of a trauma and thus because of this imbalance does not function at its fullest. Before now I have typically thought of traumas as being something in which the individual would receive an actual injury to the brain? Trauma can be physical, emotional or mental, and can be real or perceived – these all affect the brain. Common examples these days are soldiers returning from Iraq and Afghanistan. During their tour of duty they may have encountered life threatening situations or witnessed injuries or death. They may not have had any physical trauma to their own body or brain and yet they come back with severe PTSD (Post Traumatic Stress Disorder). A soldier’s brain and nervous system goes into “Fight or Flight” mode for survival. Upon returning to a safe environment, the brain does not know to reset itself, so years later a car backfiring can cause severe reactions. Many people who had difficult childhood experiences suffer from similar imbalances their whole lives. They may live with underlying anxiety, fear or depression, unable to ever sleep well, from the early childhood imprints. Brainwave Optimization has been shown to be effective for PTSD and for allowing release of childhood traumas by allowing the brain to reset itself. How do you classify “trauma”, and what might be some examples of traumas that we have experienced and thus have our lives altered because of it. There are obvious traumas such as a physical blow to the head from falling off a bike or being in an auto accident. In the case of our military in Iraq and Afghanistan explosions or injuries can affect the brain as well as the long-term exposure to battlefield stress. Other traumas are not as obvious, such as birth traumas, in utero traumas (if the mother is threatened, falls or is ill) and the emotional traumas we all experience growing up. Emotional traumas can dramatically affect the brain – growing up in an abusive home or living with an alcoholic parent in which the brain must be constantly alert to a possible threat. There are two basic types of traumas we see in the brain imbalances – invasive traumas in which one feels invaded or attacked from the outside. This could be sexual or physical abuse or assaults. The brain reacts to these types of traumas by shifting into “Fight or Flight” mode – the Autonomic Nervous System becomes Sympathetic dominant. The second type of trauma often experienced in childhood is called abandonment trauma – in which the child did not receive enough attention or touch. The brain typically goes into “Freeze” mode – Parasympathetic dominance. Anything the brain experiences as a threat to survival can cause brain imbalances – common things such as having a general anesthetic which puts the brain to sleep can cause the brain to go into the “Fight or Flight” mode. What are some side effects that individuals live with as a result of traumas that are unhealed? Brain imbalances caused by traumas can manifest in many different types of symptoms: depression, anxiety, loss of focus (including ADD and ADHD), OCD (Obsessive Compulsive Disorder). Outbursts of uncontrollable anger are common with PTSD. Sometimes the long-term affects of traumas are subtler – people lose their passion and joy for life – they experience life as a struggle and constant effort just to keep their head above water – the fun, happiness and joy they once knew has dissolved over the years. People who have had Brainwave Optimization often report a heightened sense of clarity and connection – like having a clean windshield on your car. You grow so used to looking through the haze and dirt you forget how bright, colorful and clear life can be when your brain is clear and balanced. Other clients have reported hearing themselves laugh for the first time in years. People also report a deep quiet and peace when their “racing mind” is no longer racing. Long-term meditators of 30 and 40 years report experiencing deeper and more profound meditations following brainwave sessions. Creative people experience a boost in creative energy. Athletes have quicker response times and overall better performance (it has been reported the Brainwave Optimization can lower your golf score by 3 strokes). People begin to enjoy reading again – with a clear and balanced brain the joy of reading a good book returns to people who haven’t read in years. Students report improvements and ease in learning new material. (Some studies with Neurofeedback, the pre-cursor to this technology, report an increase in IQ of 10-12 points). Talk to us in general about the healing process in relationship with the work you do? In our work we don’t claim to heal, cure or treat anyone or any specific symptoms. And we find that when someone has had their brain balanced – their whole system begins to function in an optimal way. People sleep deeper and experience feeling rested. When we get enough sleep everything in the day flows more smoothly. As the Autonomic Nervous System comes into balance, the hormones and blood flow return to a healthy state (when the system is stuck in “Fight or Flight” mode blood flow is diverted to large muscle groups – food is not digested well and a person’s skin is often pale). One part of the brain called the Hippocampus is responsible for long term memories and also for ones sense of adventure. Under stress this part of the brain can diminish 10-15% in physical size. When the stress is removed, the Hippocampus will regrow itself and begin functioning in a healthy way in about 4 weeks time. People report better memory and also an increased interest in exploring and trying new things. Often the effects of Brainwave Optimization seem to build over time – as the body becomes rested and the other systems come into balance clients begin to feel a deeper sense of well being and health. Dan, can you give us a quick overview of the science behind the technology and why it is such an advanced healing modality? Brainwave Optimization evolved out the BioFeedback and Neurofeedback work that has been done for over 40 years. People have had great results with Neurofeedback over the years, especially for seizures, ADHD, depression and other things such as Traumatic Brain Injury. 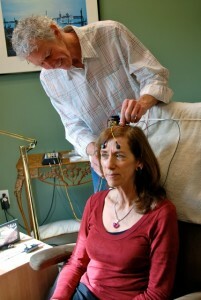 Lee Gerdes, who founded our parent company, Brain State Technologies (www.BrainStateTech.com), in 2001, developed Brainwave Optimization. Lee wrote a wonderful book, “Limitless You” (available at local bookstores in Ashland), in which he describes how he was driven to create this work in order to heal his own severe case of PTSD. The innovations that Lee has brought to the world of neuro-technologies have allowed the efficacy – how effective the process works – to be significantly improved. Brainwave Optimization takes advantage of the advances in electronics and computers by employing the latest medical grade EEG sensors and sophisticated software used to analyze the brainwaves and provide the feedback using audio tones to the brain. (Note – I (Dan) have a background in Computer Science and Physics so I can talk for hours about the underlying technology – please contact me if you would like to know more). Deborah, you and Dan are not only practitioners of Brain Wave Optimization but you have both experienced and benefited from long term use of this work. Can you share a little bit about your own association with the work? Deborah: I have better focus—for example when I read a book in the evening I can start where I left off instead of going back a page or two to “remember” what was happening. I have better physical balance—I experiment with walking on a low retaining wall to check and it’s simple!! Helping “older” people with balance is important. I know my brain has slowed down because I can now write legibly again. A rigid compulsive thought that was not going away despite trying to work through it with different healing modalities has now melted away. While these different items seem minor, they have had a big impact on my life. My career was in Social Work and I can see the wonderful advantage this technology would be in working with families. When a person comes to us they don’t have to share their past or their challenges. Some people like to do so and some don’t. Dan: Even though I had achieved a great deal success in software development with two start-ups – I still felt something was missing – I did not experience the peace and happiness that I was seeking. After years of exploring numerous spiritual, personal growth and therapeutic solutions – I was led to Brainwave Optimization. Within a few months of my initial intensive I experienced a dramatic shift – I began to experience what has become a stable, long term sense of well being that I was hoping was possible but had almost given up on finding. Can you give us a quick overview to what a typical session would look like? The process begins with an assessment of the brain patterns. EEG sensors are connected to a person’s head in a variety of locations to detect the energy patterns of the brain lobes. The client sits in a very comfortable zero gravity chair for each session which lasts about 90 minutes. Most of the time the client reclines the chair and relaxes with their eyes closed listening to the audio tones generated in real time from the EEG sensors and software. The brain then “hears” itself through stereo earphones and starts balancing and harmonizing. There is a lot of advanced technology and years of software design and yet the basic process is still a marvelous mystery – how the brain recognizes that the sounds it is hearing are reflections of it’s own frequencies. When the brain sees it’s own imbalances it starts to rebalance itself. The brain is a self-regulation system and wants to be balanced and healthy. After years of doing this work it is still awe inspiring to see someone’s brain coming back into balance. What is the experience typically like for this individual having the session done? The client spends most of the time with their eyes closed in a comfortable chair listening to the tones of their own brain while visualizing pleasant scenes, such as a quiet place in nature or looking at brightly colored objects. The process is pleasant and relaxing. While we want people to stay awake during the session, people often get so relaxed that they drift into a gentle sleep. No worries though – the brain is very active when we are sleeping and the Brainwave Optimization process is working even if the client is not consciously paying attention. You have mentioned working with PTSD, ADD, Depression and Insomnia. What have you witnessed? We had a client who had not slept well since a severe accident 25 years ago (his brain went into “Flight or Flight” mode at that time). Within a few days of the Brainwave training he began sleeping 7-8 hours a night and he was in a hotel room – he said he had never slept well in hotels. We have had clients with ADD who are completely off their medications and feeling like they finally have their lives back. Another client experienced a dramatic shift in which she felt free from her racing mind for the first time in her life – she felt she had space to live and experience life in a new way. What types of individuals can most benefit from the work you are providing? We love working with all different types of clients – from those who are severely suffering and come to BWO as a last resort – to those people who are high functioning, successful people who want improved clarity, deeper peace, well being, and increased creativity. We love working with people who have done a lot of spiritual and personal growth work but who are still not experiencing the peace and well being they know is possible for them – they have tastes of it but not the long term stable experience. We love working with kids, young people just beginning their lives and Vets with PTSD. We love working with people to support graceful aging – improved memory and clarity. (Note – recent research shows that the brain can improve memory with aging! Many of the old myths about aging are not true: older people can learn foreign languages faster than young people!). Can you share a recent success story with the technology with us? Brain State Technologies recently completed a formal clinical research project with Wake Forest Medical University on the effects of Brainwave Optimization and Insomnia. They have reported that 100% of those in the study reported dramatically improved sleep. The control group was then given the same Brainwave Optimization work and also reported 100% improvement! Finally, can you please talk to us about the future of this type of healing work? How you see it changing our planet and how something that might be very new to us now could be widely implemented in the near future? This work is profoundly effective: 85-90% of the 50,000 people worldwide have achieved the results they were looking for. There are currently more than 200 affiliates in 16 countries offering this work. We’d like to mention that our friends and colleagues, Mark and Kathleen Kellenbeck have a Brain State Affiliate business in Medford called BrainJoy. Like us, they are in this work because they personally experienced tremendous benefits and are dedicated to helping others. This work addresses the underlying causes of the problems – unlike most pharmaceutical solutions that only address the symptoms. So yes, this work has the potential to help a large number of people who are currently suffering from symptoms of brain imbalances. As I see it (Dan speaking) – each time any one of us heals, grows or reaches an expanded consciousness – all of humanity benefits. So I believe that the highest, most effective way we can help the planet and help humanity is to heal and help ourselves first. Any last words or comments to our readers? We encourage you to investigate this work – it is powerful and transformative. Check out our website at www.AshlandBrainHarmony.com and our parent company at www.BrainStateTech.com. (And watch some YouTube and Vimeo videos). We really do love to talk with people and answer questions, so feel free to call or email.